Stonecast moonstone backer with chipped edges highlights the front of snowcapped jagged mountains. but practical incentive, promotional item or personalized gift. Made of a soft leatherette material, this bi-fold wallet has the look and feel of genuine leather. Open, the wallet is 3 ½” x 8 ¾” and has a place for bills along with slots to hold 6 debit or credit cards. Closed dimensions are 3 ½” x 4 ½”, so it slips easily into your pocket or purse. Your personalization shows in black for stunning contrast and top-stitching around the edges gives it a finished look. At a price point suitable to any budget this wallet makes a great promotional item, incentive or personalized gift. Great for a gift, incentive, or promotional item, this single leatherette pen holder has the look and feel of real leather at a fraction of the cost. 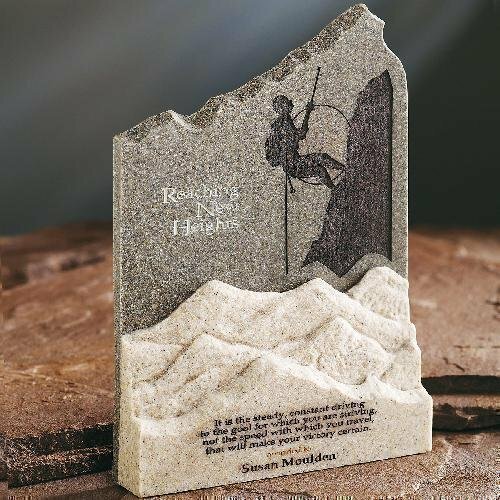 This holder can be personalized with your logo, a name, or other graphics to black for stunning contrast. With a magnetic flap closure and elastic strap inside to keep contents secure, the case is lined in black velvet and packaged in a black gift box. This pen case is as functional as it is beautiful. Protect your specs in this sturdy eyeglass case in leatherette. The case has the look, feel and durability of genuine leather at a price for any budget. The black velvet lining and snap closure provide added protection for your glasses. Personalized with your company logo, a monogram or other graphic to black for a stunning contrast, this case offers attractive functionality in a promotional item, incentive or personalized gift.